There’s so much information about aspartame on the Internet that we’ll go crazy. We have to start somewhere, so we’ll start with the experts that keep on ensuring us that it’s safe. The thing is, they deceive us about the safety of this product when in reality it’s dangerous. The experts in the medical field, the government, and other individuals who tell us not to worry are doing all of this in the name of corporate profits. First, who developed aspartame? It was the pharmaceutical company G.D. Searle which had problems getting their product approved by the FDA for 16 years. That’s because the animals that were used for the testing of aspartame developed seizures, tumors, brain lesions, and some even died from it. However, the company persisted in offering an “evidence” that their substance was safe until the Food and Drug Administration finally asked DOJ to prosecute the company for submitting false test data just so they can get aspartame approved. Then, Donald Rumsfeld became the CEO of G.D. Searle. So, when Ronald Reagan became the president of the United States, he made Rumsfeld part of his transition team. The next thing you know, a new FDA commissioner was appointed. To be more interesting, one of his first acts was approving the artificial sweetener aspartame produced by the G.D. Searle – a company that Rumsfeld was nor the head of. The National Soft Drink Association objected when it seemed like the artificial sweetener will be approved for use in carbonated drinks. They said the substance is very unstable in liquid form, and that one of the compounds it breaks down into is formaldehyde. In 1985, Monsanto bought the company that produced aspartame, and the NutraSweet Company worked as part of Monsanto until it was sold to J.W. Childs Equity Partners in 2000, where it remains today. During all this time, the Food and Drug Administration has gathered a list of more than 90 symptoms linked to consuming aspartame. Some of them are dizziness, nausea, weight gain, deafness, blindness, and even death. The worst part is that this artificial sweetener is included in more and more products. According to the Aspartame Resource Center, the substance is part of more than 6,000 products throughout the world. This center is, in fact, a public relation and information arm of one of the largest producers of aspartame, Ajinomoto (the producer of MSG, monosodium glutamate). The other one is the NutraSweet Company. But, the Aspartame Informational Center has “experts” to support their claims about the safety of aspartame, including FDA and Calorie Control Council which actually owns the website of the Aspartame Information Center. You can see it listed as the copyright holder of every page. Let’s focus a bit more on the Aspartame Resource Center (ARC). On their website, you can find many “fact” sheets to download, and one of them is “Straight Answers About Aspartame” made by the Calorie Control Council and the American Dietetic Association. Is Ajinomoto conspiring secretly with the American Dietetic Association? Well, the site of Calorie Control Council says that it represents sixty producers and suppliers of low-fat, low-calorie, and light foods and drinks, including the producers and suppliers of over a dozen dietary sweeteners. Calories Count is another site connected to the Calorie Control Council. What’s really shocking, or not, is that its sponsorship page includes names like Splenda, Ajinomoto, Sweet ’N Low, and NutraSweet. This was a lot of information, so let’s recap. 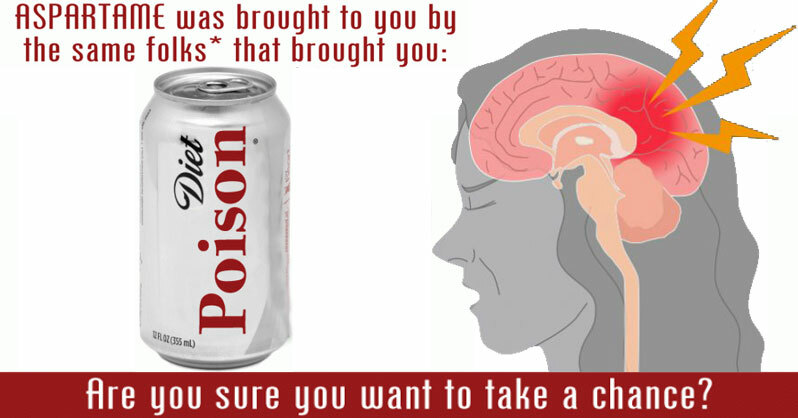 First, aspartame was thought to be dangerous according to the Food and Drug Administration, which is why they didn’t approve it for 16 years. But, once the head of the company Donald Rumsfeld became part of the transition team of the new president Reagan, a new head of the Food and Drug Administration was appointed, and aspartame was finally approved. Now, we read how safe aspartame is on different sites written by the American Dietetic Association and other reliable organizations which are actually sponsored by aspartame. And, that’s not all. Let’s see who the medical professionals behind Aspartame Resource Center actually are. Wayne Callaway, MD, was the first name on the list, and as it seems he is a pretty busy man. On his website, you can see that he is a recognized expert in nutrition who appears on national television and testifies before Congress. Dr. Callaway’s views are published nationally quite often. Being a national expert in nutrition, his views are published in well-respected medical journals and taken very seriously. His view on aspartame is that it’s totally safe and that we shouldn’t worry at all. Reading his biography, we can see that he is a member of the American Society for Clinical Nutrition which takes us to the American Society for Nutrition that publishes the highest ranked peer-reviewed journal in nutrition and dietetics – the American Journal of Clinical Nutrition. It also publishes the Journal of Nutrition which releases the latest research on topics of crucial interest to policymakers, students, researchers, and everyone with interest in nutrition. However, the sustaining members who support the American Society for Nutrition, or the American Society for Clinical Nutrition, provide financial support for scientific programs, the society’s activities in education and training, and professional outreach. On the website, you can read that these members can sponsor “educational opportunities, grants, and other items.” Strangely enough, the site doesn’t tell what these other items might be, although we all suspect that research is one of them. Get ready, here are some of these sustaining members: Cadbury Schweppes; The National Cattlemen’s Beef Association. ConAgra Foods. Campbell Soup Company. Eli Lilly. Dannon. The National Dairy Council. Gerber. General Mills. Kellog. GlaxoSmithKline. Mars. Kraft. Monsanto. McCormick. PepsiCo. Nestle. Procter & Gamble. POM Wonderful. Unilever. The Sugar Association. Wyeth. Wrigley. In other words, Dr. Callaway writes for and works with the people who are supported or paid by the food industry that uses the artificial sweetener called aspartame. In other words, he is hired by the aspartame industry to teach us that aspartame is safe. He consults for (is paid by) many agencies, including the FDA, and industry folks like Quaker Oats; the Monsanto Corporation; the Milk Industry Foundation; The American Institute of Wine and Food, NutraSweet, and many more. So, it turns out Dr. Callaway is paid by the two largest producers of aspartame – NutraSweet, and Ajinomoto to tell that the artificial sweetener is safe. So, how to know if aspartame is included in some product? The FDA requires the substance be listed on the label. But, in case it’s not, and you see “phenylalanine” on the label, it means the product contains aspartame as that’s a component of the artificial sweetener. For more information and links that could help you sort out the facts, visit Healthy Holistic Living.